I had the amazing opportunity to participate in an animal training course this week held at the San Antonio Zoo. Watching the animal care specialists train charismatic mammals, reptiles, and birds to participate in their health care in the zoo inspires me. One of the most inspiring stories was from the lion and tiger care specialists. They had a short period of time to get the young animals ready for vaccinations. They used force free training techniques, and everybody showed up and stayed calm for the injections. 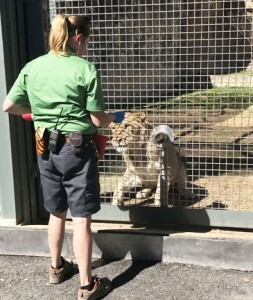 This is way more inspiring to me than the work they are doing to teach the lions to play tug-of-war with zoo guests (via a small tunnel through the plexiglass barrier) although the tug-of-war is fun. I got to play the same game with the mama jaguar, Arizona, until her cubs jumped on her and she let go of the rope. She really enjoys grabbing the rope and tugging and didn’t want to give up. 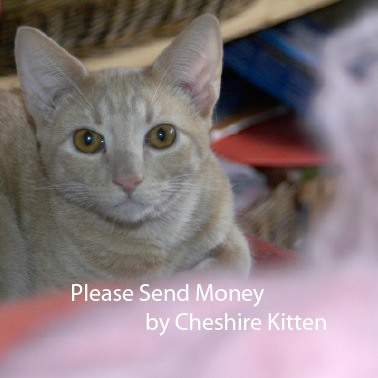 Like Arizona, my little cats love to play with ribbon, string, or yarn. The challenge is more keeping them AWAY from ribbon, string, or yarn because they are inclined to eat these playthings. They would volunteer in a minute to play tug! Volunteer for a shot??? Not going to get a lot of takers in our house. If the lions and tigers can offer their hips for their shots, so can our little friends who live with us in our homes. Today, the day after my training class, I loaded Karma and Becket into their carriers and then into the car to go to their annual visit to our wonderful veterinarian. They sang all the way to the vet, and a little at the office, but they sat on the scale and let our doctor touch every spot she needs to check out. Becket is lucky and didn’t need any tests this time. Karma had blood drawn for tests. She protested in full voice, but she went with the vet tech who carried her out of the room. Our vet is so good at handling cats that Becket got home happier than he was before he left. I can’t say the same for Karma, but she’s OK. We’re not in bad shape at all about allowing medical procedures, but I wouldn’t say Karma and Becket volunteered. And the Garden Kitties are even less likely to volunteer. While we waited for Karma’s blood work results, I talked with our vet about my project to get the Garden Kitties ready to accept injections. Where, exactly, are the vaccinations delivered on the leg? How much time does she need to finish giving the shot? The kitties and I started with targeting on my finger for a really yummy treat. They are both doing this really well now. Last time I was at the vet, I asked which leg gets the rabies vaccination. I started offering them their fave treats when I touched that spot in a pleasant way (I’m doing TTouch circular touches, actually). At my class at the zoo, I jumped on the chance to train a goat and a pig to accept injections so I can move ahead in my training with the kitties. Zoo trainers start from targeting on a target stick, add duration to the time the animal stands still, and then introduce the touch of a syringe without a needle. The goat and the pig stayed calm for that and for a touch from a syringe with a blunted needle and from a piece of wire (a partially unwound paper clip, actually). Both of them had a little bit of a reaction to a light snap from a rubber band to approximate the pinch of the injection. We gave the pig goat chow – apparently a delicacy in the pig world – as a reinforcer for staying calm on the next attempts. She flinched at first, but once she knew she was getting goat chow, she was fine with the rubber band. 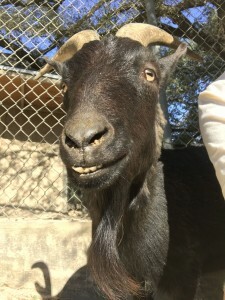 I’m not sure what would be a more desirable treat than goat chow for Dexter the goat, probably a bite of my shirt. At the zoo, I had classroom training with Barbara Heidenreich, who goes all over the world to work with animal trainers at zoos and parks. 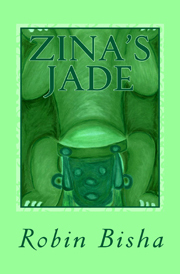 She specializes in training birds, any animal you might find in a zoo, and pet rabbits and guinea pigs. I enjoy studying with her and learn a lot each time I take a class from her, whether it’s in person or online. She’s hoping to start a television show soon. I will let you know when it starts because it will be cool and filled with tips on training animals without force. No matter which animal you live with, you will get tips and inspiration watching handlers train a leopard to calm down, an elephant to offer her hip for an injection, or a rhino to pick up his feet so the vet can check them out. 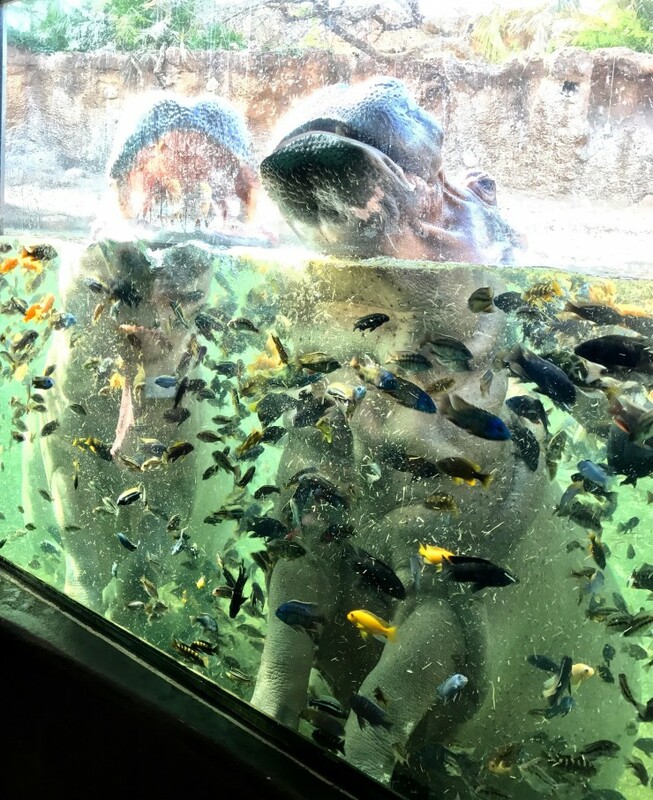 This week I observed and discussed training sessions with a sun bear, a rhino, two dwarf crocodiles, a family of jaguars, two lion cubs, two macaws, and two hippos at the San Antonio Zoo. All have their challenges and creative, caring trainers working to make life great for their animals. I trained several times with Dexter the goat. Two pigs helped us learn (one’s name is Ariel, but I forgot the other one, sorry pig! ), as did a pond full of super-uninterested koi, and Jason the squirrel monkey and his extremely active family members. All 10 of us in my training group were simultaneously training the monkeys to hold onto a carabiner, or even just to stay with their assigned trainer. Squirrel monkeys love their meal worm treats. 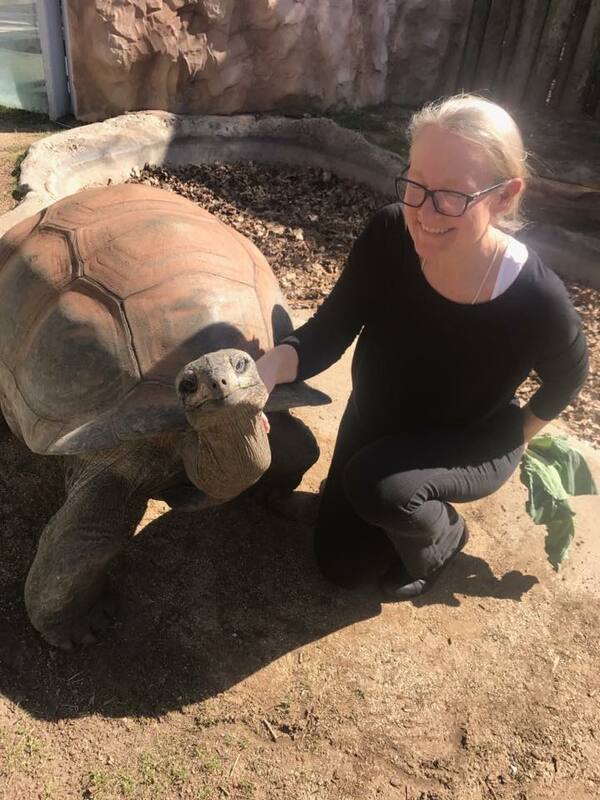 My favorite moment of hands-on training was with George, an Aldabra tortoise. George is over 80 and huge. He’s training to target, and his reinforcer was collard greens. I really enjoyed being around George, and he targeted all the way across his yard with us. The zoo offers guests the opportunity to feed the tortoises on Tuesdays, Thursdays and Saturdays, so you could feed George and his buddies Bruno and Edie, too. When I got home at the end of the full day of learning more advanced training techniques, I took off my training clothes (the cats were NOT thrilled by the smell of goat), put Meggy’s harness on and cuddled with her. Cuddling with her is the reinforcer that will help to remind her that wearing her harness is OK. I hope I can get as creative as the zoo trainers who were in my class and do more great work with my little buddies. what an absolutely amazing opportunity for you – and for the animals at the zoo.